Seashore mallow lights up the salt and brackish marshes of the Atlantic and Chesapeake Bay shores of Virginia in summer with its rosy pink parade of 2-3-inch blooms from July to September or even October. It is one of the commonest of the wildflowers that decorate the otherwise relentless summer green of grasses, rushes, and sedges across the vast expanses of marsh. Identifiable even from a speeding car, it cannot be missed in season and brightens the way of all who dare to slog through the muck of the marshes. So attractive and characteristic of the native coastal flora is the seashore mallow that it was selected by the South Hampton Roads chapter of VNPS as their floral logo. Kosteletzkya virginica (“Virginian”) was first described by Linnaeus in 1753 as a species ofHibiscus, but in 1835 the Czech physician-botanist Carl Presl transferred it to the new genus Kosteletzkya, named for the Bohemian medical botanist Vincenz Franz Kosteletzky (1801-1887). 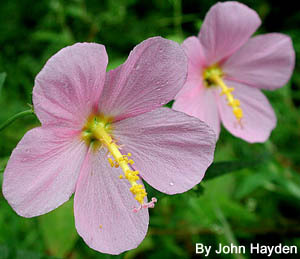 Other vernacular names used for the seashore mallow are seaside mallow, marsh mallow, pink mallow, salt-marsh mallow, and Virginia salt-marsh mallow. Marsh mallow, marsh-mallow, and marshmallow–it’s all the same name, as with salt marsh, salt-marsh, and saltmarsh, usage depending on author, editor, or context. The seashore mallow belongs to the cotton family, Malvaceae, a cosmopolitan family of about 80 genera and over 1000 species concentrated in the American tropics and absent only from the world’s coldest regions. It includes herbs, shrubs, and trees. Hibiscus, with about 300 species, is the largest genus, which includes ornamentals and the famous gumbo vegetable, okra – the young fruit ofH. esculentus. 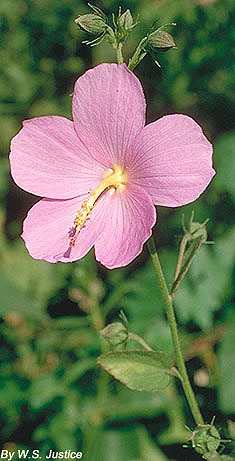 The European marsh mallow,Althaea officinalis, has a mucilaginous root that was the original source of the paste used to make the namesake confection “marshmallow.” Apart from food plants and many popular garden flowers, by far the most important contribution of the family is cotton (Gossypium). Kosteletzkya is a genus of mallows of about 30 species found in North and South America, Caribbean, southern Europe, Africa, Madagascar, and the Malay Archipelago. Kosteletzkya virginica, of the southeastern U.S., is the only species that occurs over a large area in North America. A second, West Indian species, K. depressa, barely makes it to the southern tip of Florida (Monroe County). Seashore mallow is an herbaceous perennial that grows from a tough crown of roots and may get more than 3 ft tall. Its gray-green leaves are 3-6 in long, half as wide, and typically more or less triangular with spreading basal lobes (hastate). The whole plant is somewhat roughened with tiny stellate (star-shaped) hairs. The stalked leaves are finely or sometimes coarsely toothed. The flowers may be borne singly in the leaf axils or in terminal, leafy panicles. The 5 pale to deep pink or occasionally white, spreading, separate petals are up to 1.5 in long and wedge-shaped but rounded at the tip. The numerous stamens form a column around the pistil and its 5 styles, which are capped by pinhead-like stigmas. The 5-celled pistil matures into a squatty 5-parted and -angled capsule that is less than a half-inch across and bears 1 seed per part. Seashore mallow is relatively easy to grow under a variety of moisture conditions including good garden soil. It is available from nurseries. Plant in rich, moist to wet soil in full sun. Plants are tolerant of windblown and soil borne salt. They thrive under ordinary garden conditions as long as the soil is not too dry. Plants emerge late, so take care not to dig into them. Propagate from seed, which ripens in late autumn. Seashore mallow grows in salt, brackish, and almost fresh marshes and along shores and edges of bogs, swamps and mangroves on the outer coastal plain from New York (historically) and Delaware to Florida and Texas. It also occurs in Bermuda and the West Indies. It blooms earlier in the summer southward, perhaps as early as May or June. A wildflower of southeastern Virginia, seashore mallow is found in the Atlantic coastal and tidewater counties of the state, up the Potomac as far as Prince William County. (see plot of county distribution in Atlas of the Virginia Flora, III, 1992). It blooms mainly from July to September. The main threat to this common native species is habitat destruction. Text from 2004 Virginia Wildflower of the Year brochure, written by Stanwyn G. Shetler and adapted by him for the Web, December 12, 2003.